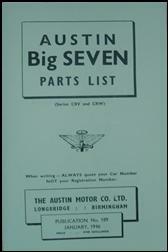 The Austin Motor Co. Ltd. produced many books to help with driving, servicing costs, parts purchase and identification. In the later years of the Seven there were also Body Parts identification list and after the war some maintenance books. Operating instructions and features of the car including specification, running adjustments, servicing, electrical wiring diagram and lubrication. Listing of spare parts and most are illustrated. Covers most parts from chassis to petrol tank, no body parts are shown except in special body parts books. These books listed prices of most parts by part no and were updated as new parts and price adjustments were implemented. Austin issued fixed price servicing and repairs cost. These books list the charges, frequently reviewed by issue of new books. 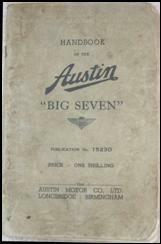 For a complete listing of Austin Seven Handbooks published by The Austin Motor Co. Ltd. visit the A7CA website (select Historic Information, then Documentation). Some handbooks can be downloaded as a pdf file. Often ignored by some of the Austin Seven fraternity as they say it's not a 'Seven'. The Big Seven was recognised by Austin as a 'Seven' and that is good enough for all Big Seven owners. It adds to the multiple designs of Sevens with the movement to the post-war designs of Austin cars. It was built for a price competitive market and 20,171 were sold between July 13th 1937 and January 1939, although Ford and Morris were dominant in the market at this time. For good reading on the Big Seven see The Austin Seven Club's Association Magazine 1975D pages 30-38 and the very good article by Jonathan Oglesby, who I believe started and ran the Big Seven Register. It details more than we can print here about the 'Sixlite' (CRV) and 'Forlite' (CRW) saloons. Below are listed the Big Seven publications which I know exist, no doubt there are others. Most Big Seven handbooks were printed with light green covers. The books follow more or less the same format as the first A7 Handbooks in 1922. Publication of the handbook series started in July 1937 with publication no 1523 and covered the original 'Sixlite' saloon introduced at this time. This is an excellent book for the owner driver covering all aspects of routine maintenance and servicing. A lubrication chart with a list of recommended lubricants is shown. One key feature of this handbook is the cut-away picture of the engine, gearbox and dynamo. The handbooks do not show any pictures of the cars, only a drawing of the interior showing driver controls. The second Big 7 handbook published in October 1937 was 1523A. The printed changes in this book are: Luggage platform permissible load reduced from 112lb to 56lb. Change to steering box lubricants is recommended in the lubricants chart. February 1938 saw handbook 1523B introduced. Changes saw the layout of page on the ignition system with more detail on timing the ignition adjustments (Page 28). The recommended lubricants chart shows more changes as manufacturers updated grease and oils, and brake adjusters were added to lubricant layout chart. Handbook 1523C came out in June 1938 after the introduction of the two door 'Forlite' saloon in March 1938 and is the same as the previous book. September 1938 saw the publication of Handbook 1523D. The section which explains how the fuel pump works has a new diagram of the pump. The notes on the cooling system have more detail on draining the system. The electrical section shows and oblong stop/tail light as against the previous book where it was shown as round, although the Parts list issued in the October still shows the round types. 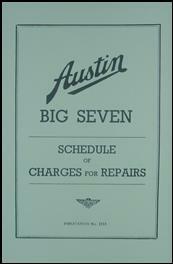 I cannot say this was the last Handbook of the Big Seven because as late as May 1954 (843/B) and September 1957 (843/C) Austin produced a publication called Austin Cars 1936-39 Running and Maintenance Instructions. It covered Austin Seven, Big Seven and up to the larger cars such as Twenty-Eight. Those handy books of 72 pages, including specifications of cars made during the pre-war period with wiring diagrams and lubrication charts and full maintenance instructions. In December 1937 the Big Seven owners saw the first spare parts book, publication no 1598. Although there is no guidance on the actual date of release the parts book it is dated December whilst the car was introduced the previous July. These books used the actual Austin part numbers as other late books against reference numbers used in early books. The second Spare Parts List 1598A published in March 1938 states that it embodies alterations made up to chassis No. 7100. Page 21 shows change in the exhaust pipe with the silencer and tail pipe listed as separate items and an export version. The gearbox section lists changes to the clutch pit bottom cover and the clutch pages list different part numbers on the flywheel. The pages on steering show changes with the traffic and horn switch. The engine mounting page shows a bracket for the starting handle with a guide tube added. When 1598B was published in October 1938 it covered changes made up to chassis No: 13,500. Changes show different part numbers and illustration on piston scraper rings and clamping pins. A different starting handle is shown on page 12. This book also shows changes to the radiator assembly. The clamping plate for distributor has been changed with a different part no and the clutch pit bottom cover is changed again. However, after the war in January 1946 Austin printed publication 189 (light green cover) which is a list of parts without illustrations and covered both cars from 1937-39. This book is useful for the discerning Big 7 enthusiast as it details when changes were made to parts by chassis no and exceptions. It was followed up by as similar book, 189A, in June of that year. Two further publications which could be classed as Parts List are: 1648 Body Parts list which showed illustrations of body parts such as wing, doors and body fittings etc and covered Big Seven 'Sixlite' (CRV) and was published in March 1938. 'Forlite' (CRW) owners would need Body Parts List 1745 released later that year in December, and, to assist owner drivers was the Austin Seven and Austin Big Seven Price List of Spare Parts issued in April 1938 as publication no. 1653 (54 pages). This covered all Austin Seven parts and has a conversion chart so earlier reference numbers in parts lists could be cross referenced to the actual Austin Part no. You need the Spare Parts list to identify a part number. A further list with additions and deletions was printed in October 1938 as 1653A. Publication No. 1713 Schedule of Charges for Repairs on the Big Seven detailed costs to customer of most of the repair and service functions on the Big Seven, and was published in September 1938. The conditions printed outlined terms under which repairs were carried out. A comparison of charges shows that you paid marginally more for labour on a Big Seven against other Sevens, hence, no doubt, the separate book. Austin Dealers were issued with garage charts. Publication 1559 featured a Big Seven lubrication chart and was published in 1937 and 1559B in April 1938. These were actual Austin issue and there were others from the oil companies at the time. 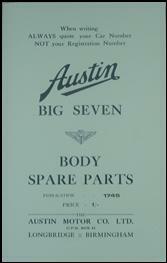 Dealers were also issued with an unnumbered publication: Austin Big Seven Table of Suggested Stocks of Spare Parts (various amounts) 1938 Season, and other issues. Austin Light Cars, Running and Maintenance Instructions, 7, Big 7, 10, 12, 14. Running and Maintenance Instructions: 7, Big 7, 10, 12, 14, 18, 20, 28. This article, written by Peter Kemp, originally appeared in CA7C Seven Focus, October 2003 pp13-17. Notes on Big Seven maintenance etc.